I'm sure you've heard of the health benefits of aloe vera before ... you've probably heard of its healing properties, especially after a day laying out under the sun on the beach. In looking into natural skincare, I discovered that not only is aloe vera applied topically, but it is consumed as a digestive aid. In health stores, aloe vera is generally sold in two liquid forms: juice and gel. There are generally two types of aloe vera juice sold on the market for consumption, and those are: whole leaf and inner fillet. Some research seems to point to the notion that parts of the aloe leaf contain toxins that, if consumed in large quantities, are not good for your system. For that reason, people generally recommend the inner fillet juices if the aloe vera is being used as a dietary supplement. Aloe vera also comes in gel form, which I have never used but understand can physically look either like a gel or a liquid. Of course, I don't use aloe vera for dietary reasons, but in my skincare. I've been experimenting with making my own moisturizers and body lotions, and in order to emulsify wax and oil, you need some sort of water. Purified or distilled water works, but so does aloe vera juice. On a more basic level, I have experimented with using aloe vera juice as a toner or moisturizing facial spray, and I've found it be an incredible moisturizer. I initially used it as a moisturizing spray underneath my nighttime moisturizer, but found after a couple of uses that the combination was actually too greasy, so sometimes I use the aloe vera juice alone as a moisturizer. The aloe vera juice tends to leave behind a sheen and a layer of something that might resemble a silicone moisturizer, so I wouldn't recommend using it in the morning. I also have dry-to-combination skin, so I'm not sure aloe vera would be recommendable for oily skin types, though I have a sneaking suspicion that it would adapt in its own ways to any skin type. Natural ingredients often have the tendency to do that. I have also used aloe vera juice as a healing agent, on rashes and mosquito bites. It's a temporary fix, but it does calm the skin down and relieve the area for a couple of hours. Aloe vera juice also offers a temporary fix to an irritated scalp -- I used this as a spray both in my hair and on my scalp following the disaster state that the Garnier Fructis Triple Nutrition Fortifying Creme Shampoo left my scalp in, and my scalp would definitely calm down and be less flaky the shampoo following the aloe vera application, for one shampoo only. I found coconut oil to be a far more effective scalp treatment. Aloe vera juice contains protein, so it's often recommended as a treatment for the hair shaft (sprayed on and left for several hours before shampooed out), but I didn't find that it did anything for my hair other than making it softer. I only used it once for this purpose, however, and I have thick, frizzy hair. Other hair types may find it more beneficial. So ... another multipurpose "miracle" ingredient, though I don't find it altogether as useful as coconut oil. Aloe vera juice, of course, is much more watery than coconut oil and has properties like water and not oil. Aloe vera juice, however, has a scent that may not suit everyone, though it does not last in the least. It has a pretty indescribable smell, but I would say that it reminds me of a mix of Elmer's glue and medicinal herbs. I have heard that it is not pleasant to take by mouth, either. Last but not least, it doesn't quite have the shelf life that coconut oil has. Though aloe vera juice may have an expiration date of a year or two from the date of purchase, it's generally understood that if you are consuming the juice, it should be used up within two weeks of opening it. Used in hair and skincare, I'd probably chuck it out after six to eight months. 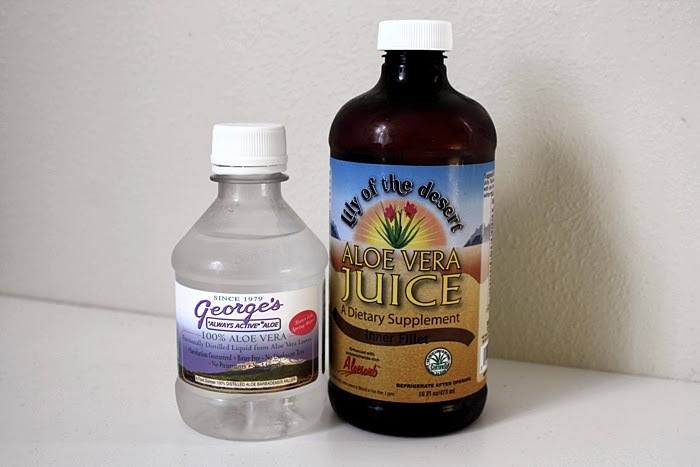 There is a scent-free, flavor-free alternative to the typical aloe vera juice, and that is the George's Always Active brand of aloe vera, which has been distilled and is said to contain all of the original nutrients of aloe vera. George's is, understandably, much more expensive than non-filtered aloe vera juice. Have you used aloe vera, either as a part of your beauty regimen or as a health supplement? Did you find other uses for it?